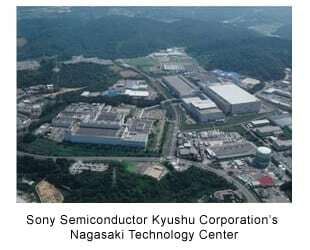 December 24, 2010, Tokyo, Japan - Sony Corporation ("Sony") today announced that Sony plans to invest approximately 100 billion yen in Sony Semiconductor Kyushu Corporation's Nagasaki Technology Center ("Nagasaki TEC") in the fiscal year ending March 31, 2012, to increase the production capacity for CMOS image sensors. This investment plan includes (i) the transfer of the semiconductor fabrication facilities from Toshiba Corporation ("Toshiba") contemplated under a non-binding memorandum of understanding between Sony and Toshiba jointly announced on December 24, 2010, (ii) refurbishment of a part of the above semiconductor fabrication facilities into new wafer lines capable of manufacturing CMOS image sensors, and (iii) refurbishment and equipment of a part of production facilities at Nagasaki TEC Building 3 for wafer processing to differentiate Sony's CMOS image sensors with Sony's independently developed unique technologies. *1 Through the investment plan, Sony will utilize a governmental subsidy to be provided by the Ministry of Economy, Trade and Industry in Japan - the "subsidy for programs to promote siting low-carbon job-creating industries" - mainly in connection with the investment mentioned in (iii) above. *1:These investments are subject to the execution of definitive agreements between Sony and Toshiba and the consummation of the contemplated transfer of the semiconductor fabrication facilities mentioned in (i) above. These investments will further strengthen Sony's production capacity for "Exmor" and "Exmor R" CMOS image sensors in order to meet increased demand from markets such as those for smartphones and Digital Still Cameras. Through this increase of capacity, Sony expects to solidify its position as the world's leading company in CMOS image sensors and CCD image sensors. *2:This total production capacity (300mm wafer basis) includes the output of foundry operations to which Sony outsources a part of the manufacturing process. In calculating total production capacity, the capacity of 200mm wafer production lines in Kagoshima Technology Center and Nagasaki TEC is converted for purposes of the calculation to the new 300mm wafer production capacity basis. -Contemplated acquisition of semiconductor fabrication facilities owned by Toshiba. -Refurbishment of a part of manufacturing facilities at Nagasaki TEC Fab2, contemplated to acquire from Toshiba, into CMOS image sensor production facilities (new installments and conversions). -Refurbishment and equipment of a part of production facilities at Nagasaki TEC Building 3 for processing wafers for CMOS image sensors. *"Exmor" and "Exmor R" are trademarks of Sony Corporation.